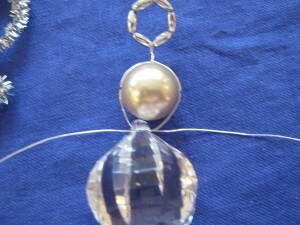 When I sat down to work on the instructions for the beaded angel ornament I wasn’t sure exactly what I was going to do. So, I got out all of my crafty stuff and played around a bit. The end products weren’t all winners, but just because something isn’t my cup of tea, doesn’t mean it can’t be yours. So… I thought I’d share. First up, pipe cleaner wings. 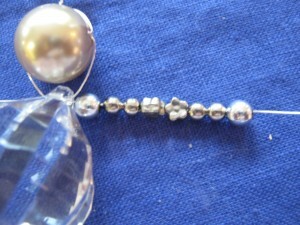 Run the pipe cleaner through your top dress bead. 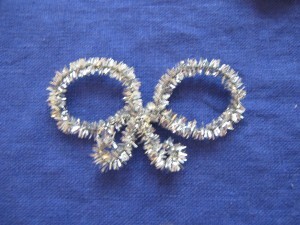 Th next photo will show you what to do with the pipe cleaner, but it isn’t attached in the photo. I did this intentionally, because it’s so much easier to see the bow shape (for construction purposes) when it isn’t attached to the ornament. Basically, your just going to form a loop on either side and give it a twist or two to keep it in place. You aren’t actually tying a bow. 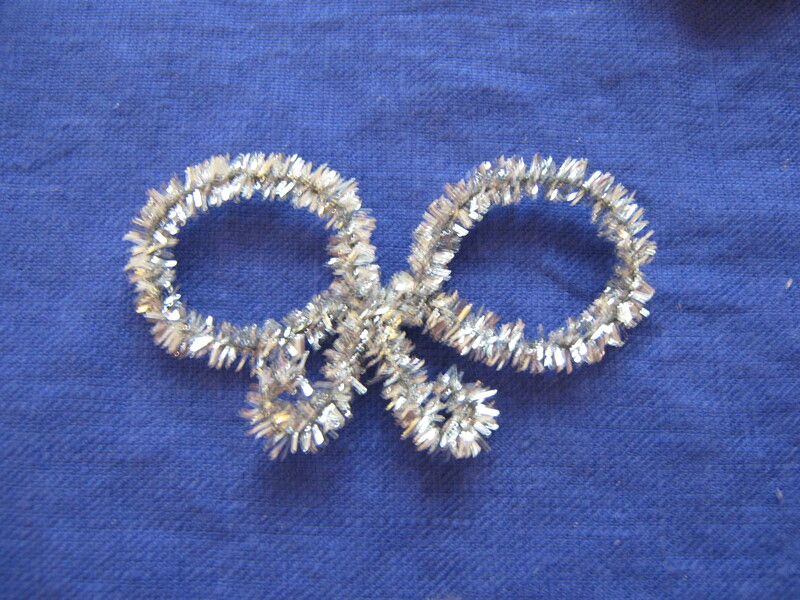 You’ll then trim your pipe cleaner and curl up the ends, giving it a butterfly shape. This is what it is going to look like once you twist the pipe cleaners. in this photo, the bottom half of the wings has yet to be trimmed and coiled up. Finished Angel Ornament. The other thing that you can do here is bring the ends of the pipe cleaner around to the front so that they serve as arms. 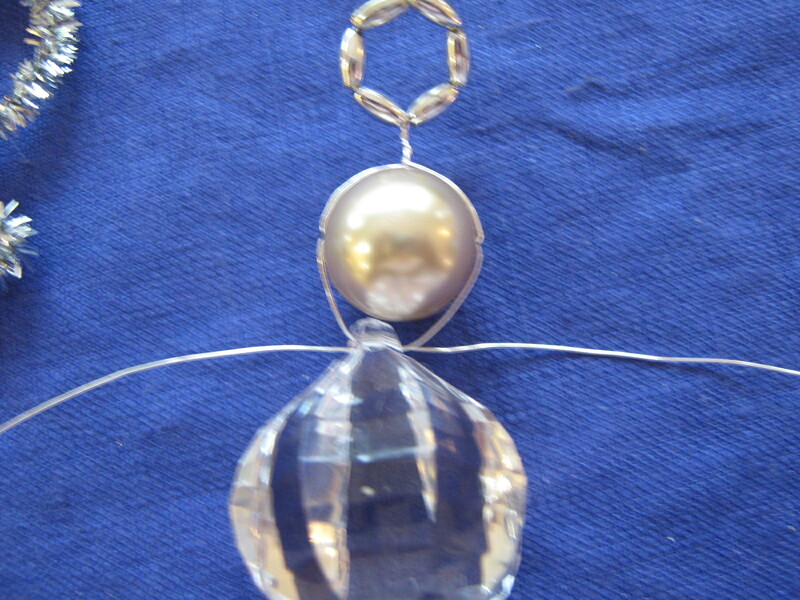 The Halo on this angel was done by the first method. 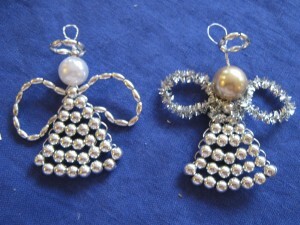 You can find instructions for it in the other Beaded Angel Ornament Post. 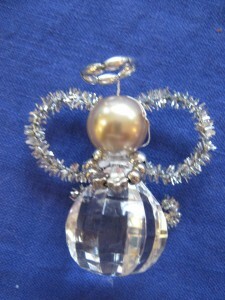 This next angel ornament was made from the top down. I started with six of those little oat shaped beads that I got at the craft store, formed a loop and gave it a few good twists. Say hello to the Halo. I added the head a bit differently on this one. I was using fairly fine wire. 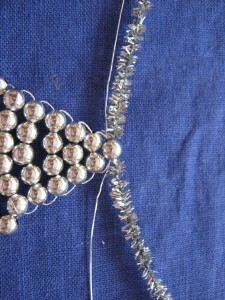 Crossing the wires through the bead horizontally allowed me to really snug things up, preventing the head bead from moving around. 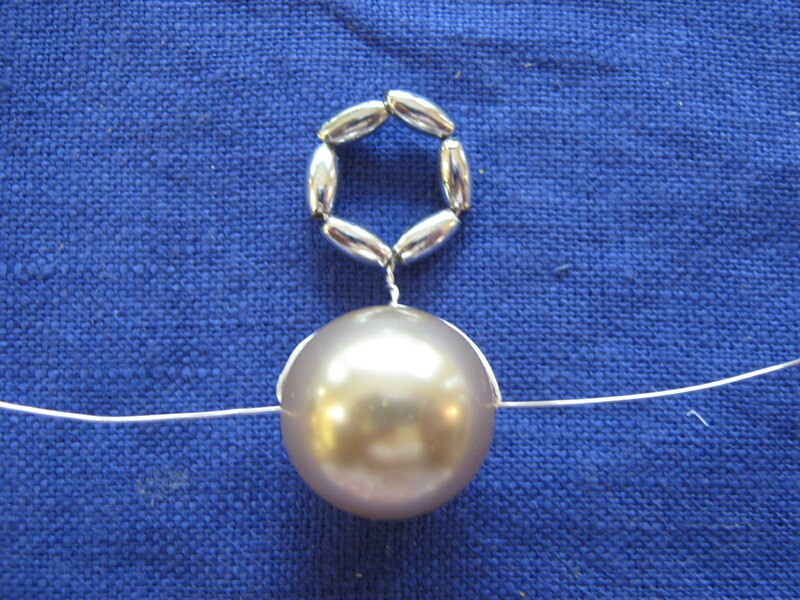 If you want to go straight down through the head, you can first cross them through a smaller anchor bead as I did in the previous post. The link for it is two paragraphs up. 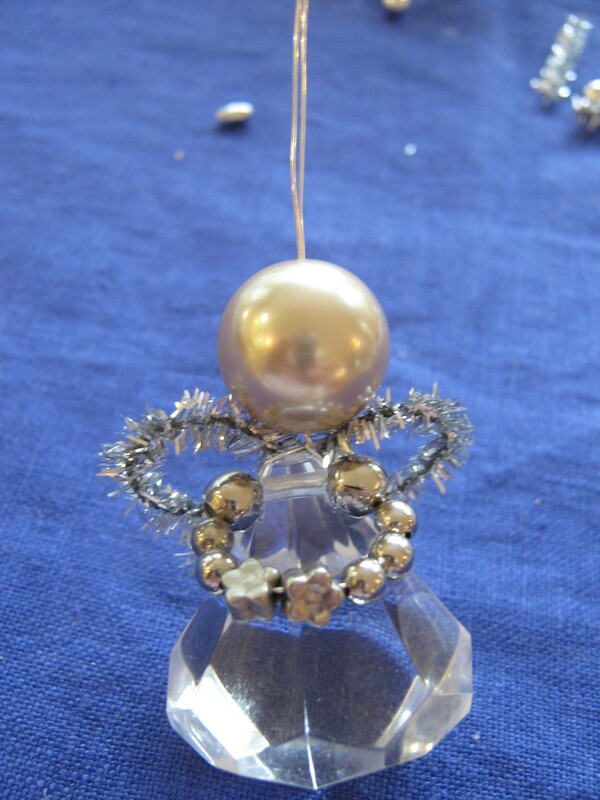 I actually like this style of angel ornament the best. Years ago I bought a bag of drop shaped plastic beads. They’re the sort of beads you’d see hanging from a chain under a lamp. 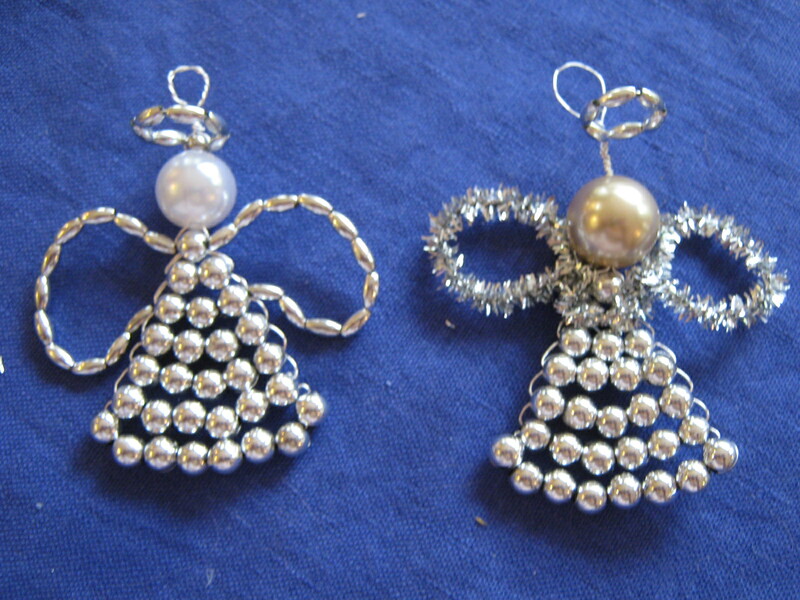 They work well for making the angel’s body and, for an added bonus, take less time as you don’t have to do rows and rows of beads. 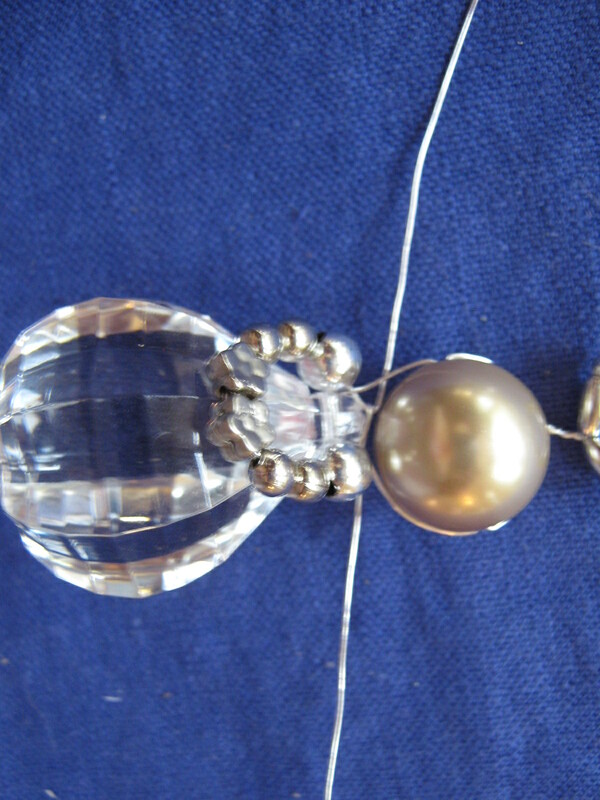 Also, they g ive the ornament a bit more shape and I really like that. This angel got arms, so there is a bit of cross weaving here. 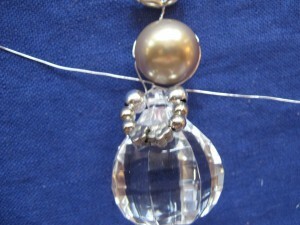 I put on a round silver bead for her shoulder, two much tinier silver beads for her arms and two little flower shaped beads for her hands. I followed those up with two more arm beads and the other shoulder. You bring the beads across the front of the body. 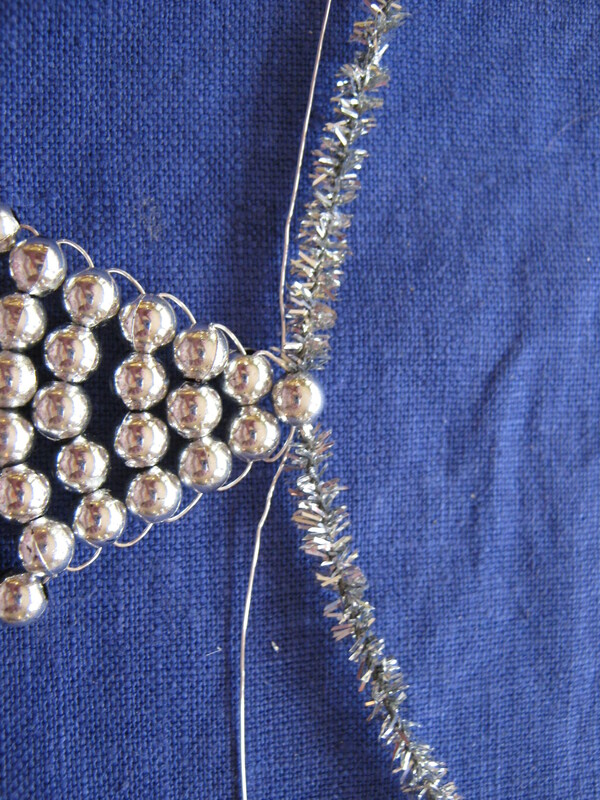 You’ll thread the wire from the other side through all of the beads, going in the opposite direction and will cross the beads through the body bead again. It should then look something like this. This isn’t the greatest photo but I hope you can tell what’s going on here. 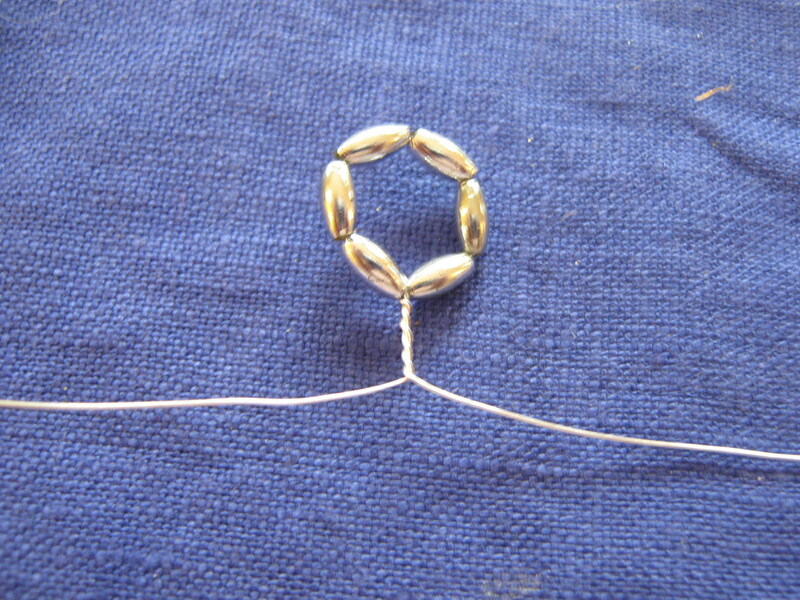 From this point, all you need to do is make a simple wrapped loop so that you can attach a hanger. Instructions for making a wire wrapped loop can be found here. It’s not very hard to do, but it may take some practice. 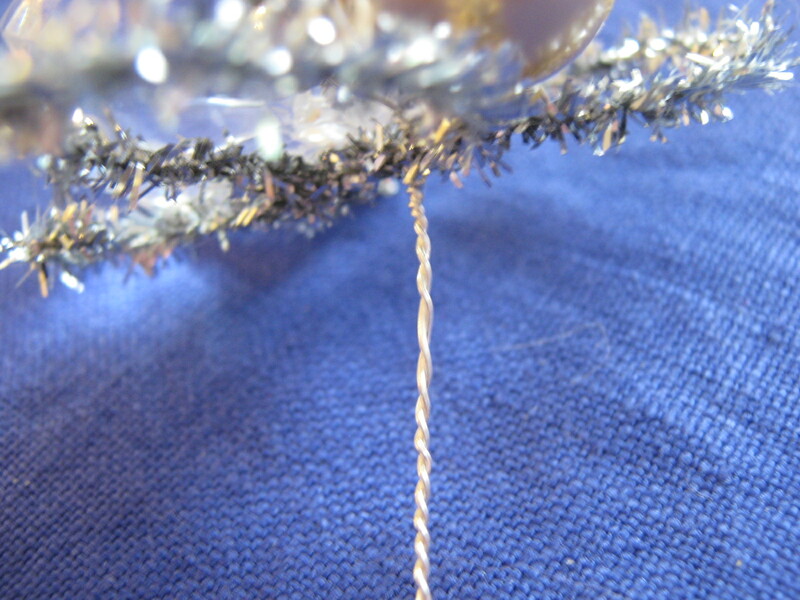 You can either attach a simple ornament hook or a ribbon to the loop so that you can hang your ornament on your tree. Here she is. The picture doesn’t do the ornament justice. I like this style much more than I do the other kind. They also come together much more quickly. I’m not sure how things are for you, but the closer we get to Christmas, the less time I have to devote to fun projects. 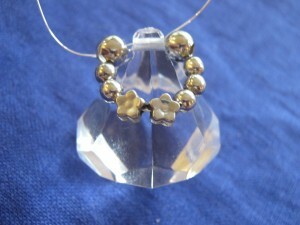 This ornament can also be made from the bottom up. 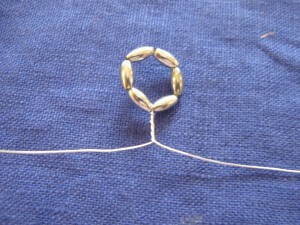 You just center your arms beads on the center of the wire and then cross them through the body bead. Again, you can add which ever wing style you prefer. 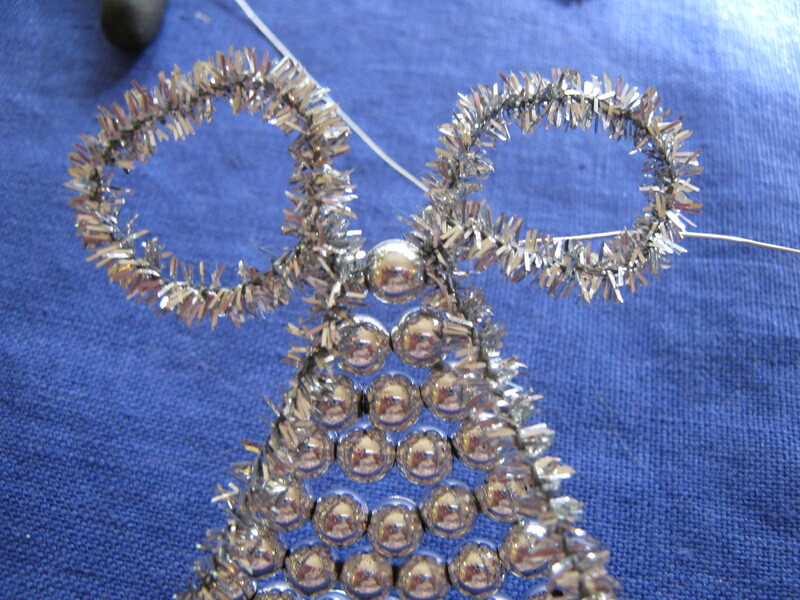 Once you have the wings on, you can just thread both wires wires up through a head bead, and add a halo and hoop via whichever method you prefer. 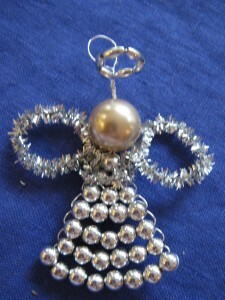 Instructions for adding a halo can be found in my other beaded angel ornament post.